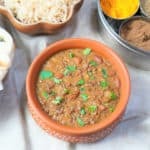 Instant Pot Dal Makhani with pot-in-pot brown rice, an easy and delicious one-pot meal. This dal is also popularly known as Madras Lentils. This restaurant style Dal Makhani made in the pressure cooker is rich, creamy and flavorful. Dal Makhani goes really well with basmati rice and naan. 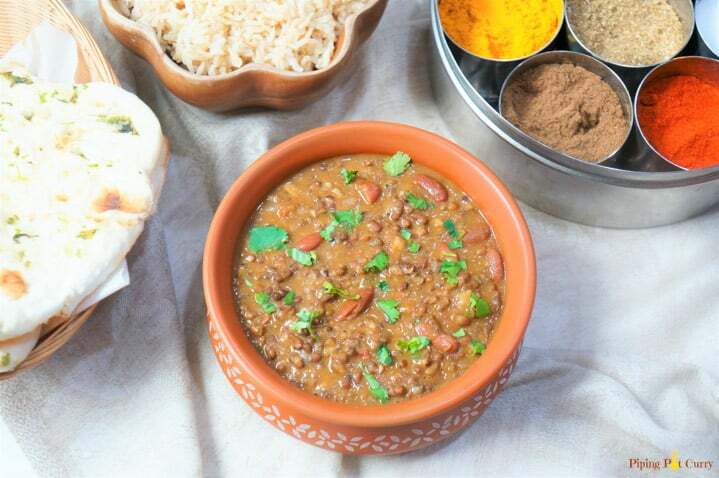 This is one of the most popular Punjabi dal – Dal Makhani. Interestingly this is very similar to Madras Lentils you might have tasted at Costco. Most people order this dal when in an Indian restaurant. This was my favorite dal when growing up and it still is. Usually this dal is slow cooked, which can take hours, however here I have used the pressure cooker to prepare it in 50 minutes, most of which is passive time. I will also share the recipe to make this dal in a stovetop pressure cooker. Want to find other easy Instant Pot Indian Recipes? 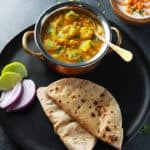 Here are 29 Best Instant Pot Indian Vegetarian Recipes for you to try! Dal makhani, also called dal makhni is a dish originating from the Punjab region in the Indian subcontinent. Dal Makhani translates to “buttery lentils”. 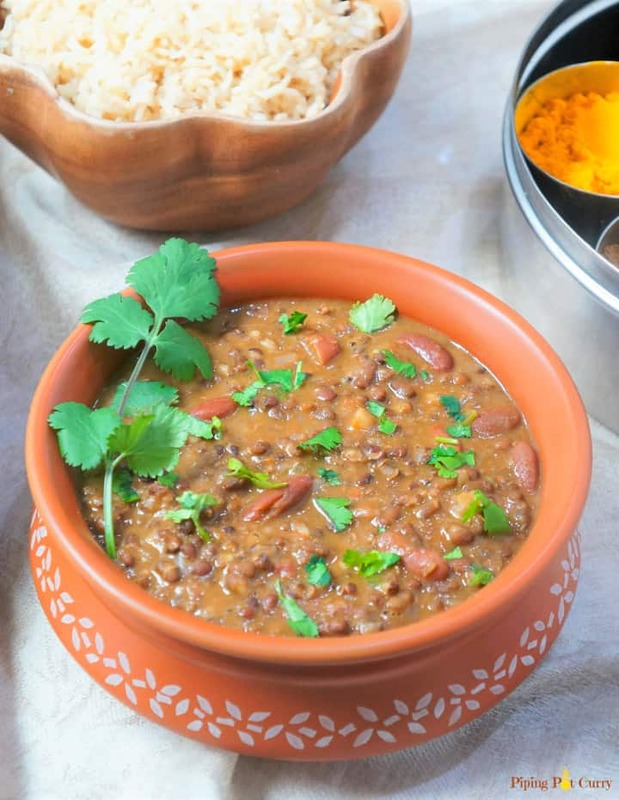 Dal Makhani is traditionally made with whole black urad dal (black lentils) and rajma (kidney beans), butter and cream. You will also find many people referring to this dal as Black Dal or Kaali Dal. As the name suggests, this dal is prepared with butter…makhani. Black gram lentils and red kidney beans cooked with onions, tomatoes, lots of ginger, garlic and butter…yum! So let loose and add on the butter (or ghee) when preparing this dal. However skip the butter and add oil to make this dish vegan. 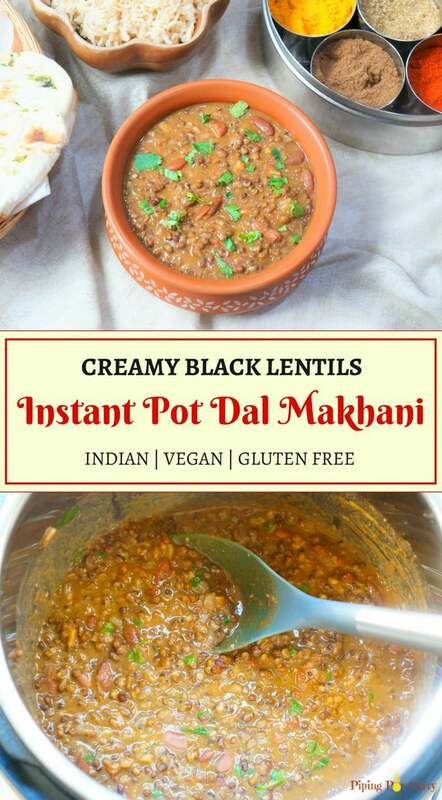 How to make Dal Makhani in Instant Pot? Start with soaking the lentils and beans in ample water for 4 hours or overnight. The soaking is mainly required for the kidney beans, but I find it easier to just soak them together. We will use the basic pantry ingredients in this Dal Makhani. 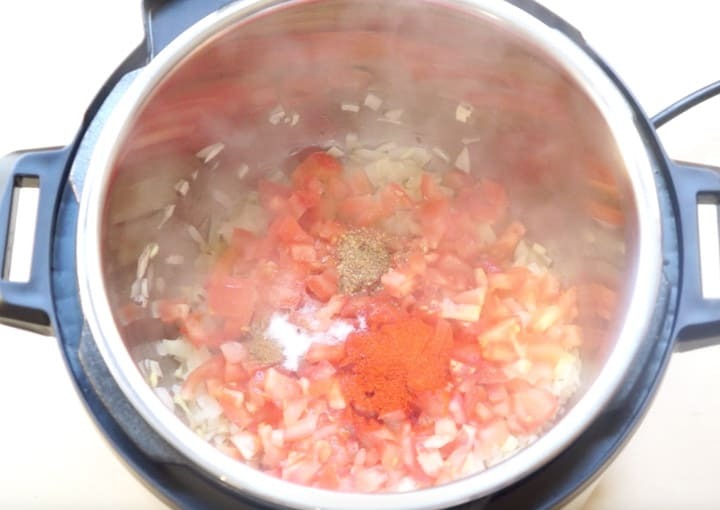 The only 4 fresh things required are – onion, tomato, ginger and garlic. 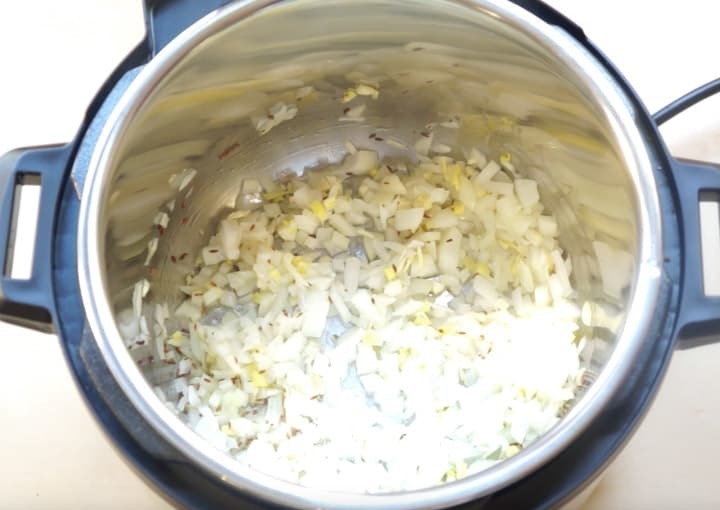 When you are ready to cook, start with sautéing butter, cumin seeds in the Instant Pot. Then add onions and sauté for a few minutes until they start turning golden. Then add the tomatoes and spices. That is all the active work required for this recipe. Now just stir in the lentils and water, and set to pressure cook. After the pressure cooking is done, Dal Makhani should be ready. If needed, add water to get the desired consistency. I like to stir in some lemon juice and garnish with cilantro. My mom likes to get the perfect reddish color similar to restaurant style dal makhani. Here is the trick I learnt from her to get that perfect reddish color – Soak 2-3 Kashmiri red chilis for half hour. Then grind them to a paste with some water and add when you add the tomatoes. You will love the color and the added taste from the kashmiri chili. I do this in my Pav Bhaji recipe too. Kashmiri chili’s are very mild, so they will not make the dal too spicy. Do skip the chili powder in the recipe if you go this route. 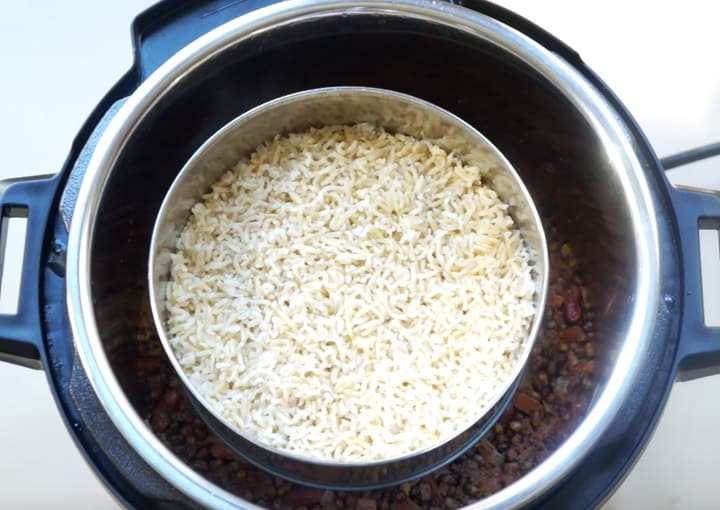 How to make Madras Lentils in Instant Pot? I could not find much history for the name Madras Lentils. 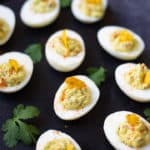 However Tasty Bite brand, available at Costco and other major grocery chains, has certainly made this a popular dish. 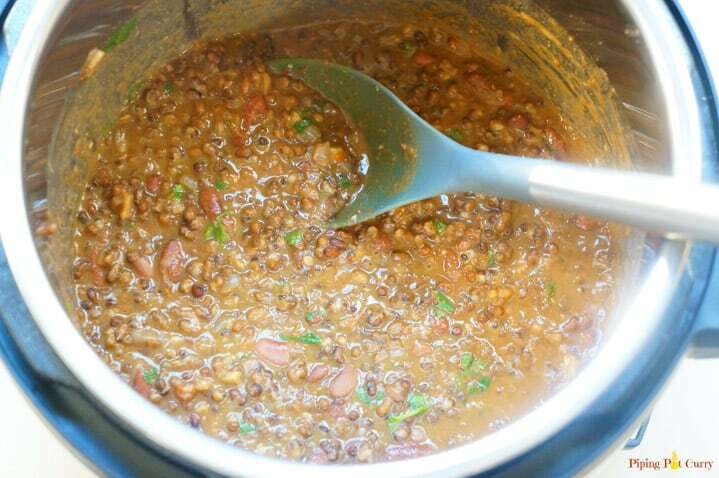 Let’s see the differences between Dal Makhani and Madras lentils. The ingredients listed on the Tasty Bite Madras Lentils pack are – Water, Tomato, Lentils, Red Beans, Onions, Cream, Butter, Salt, Oil, Chillies, Cumin. My understanding is that they use adzuki beans (chori in hindi) in place of black gram lentils. The spices used are much lesser, only cumin and chili. So it is milder than Dal Makhani. Typically I don’t add any cream when making Dal Makhani at home. Cream is added in Madras Lentils. Other than that, I really don’t see any differences. So you can follow the same recipe below with adzuki beans and just adjust the spices to make the popular Madras Lentils. 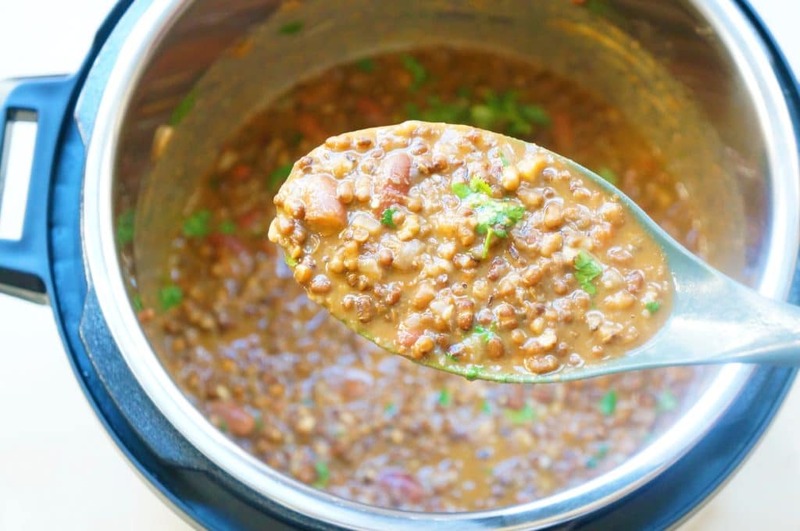 How to make Dal Makhani in a Stovetop Pressure Cooker? Follow the same steps as above. Pressure cook for at least 45 minutes on medium heat or 8-10 whistles. Let pressure release naturally. Another important thing with pot-in-pot cooking is to consider the cooking time for the dishes you want to cook together. As an example, Dal Makhani takes about 30 mins to cook at high pressure and brown rice takes about 22-25 mins at high pressure. Hence if I add rice pot-in-pot with beans, they would get cooked well. I would not cook white rice along with Dal Makhani, however they would work well with split yellow lentils that cook in 5-6 mins at high pressure. 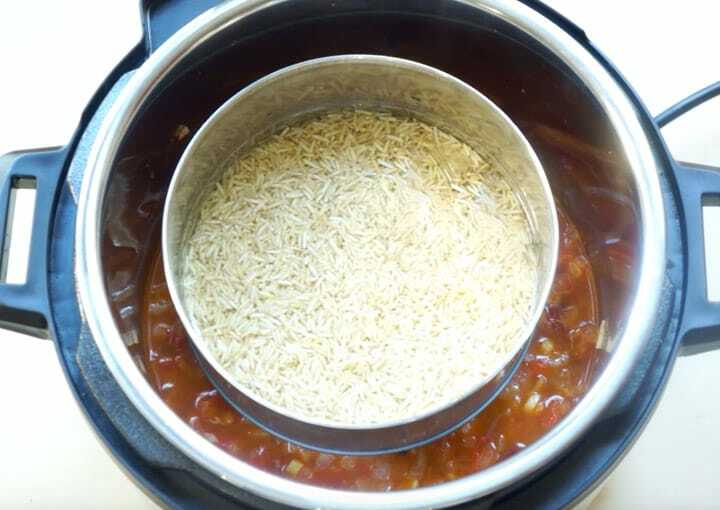 Once you add all ingredients for Dal in the instant pot, place the trivet and then the bowl of brown rice with water. This way they will both cook together. Enjoy the meal! This Dal Makhani is so creamy and flavorful. This restaurant style Dal Makhani is a great addition to your next party or potluck. The best part is you can prepare it the day before and it gets more flavorful the next day. Just before serving, heat it well, top with some butter and cream. And you are good to go! Most of the ingredients in this Dal Makhani is already vegan, except the butter and cream (if you are adding). To make this dal vegan, just replace butter with your favorite plant based oil and use coconut milk or coconut cream at the end. Can I use canned kidney beans when making Dal Makhani? 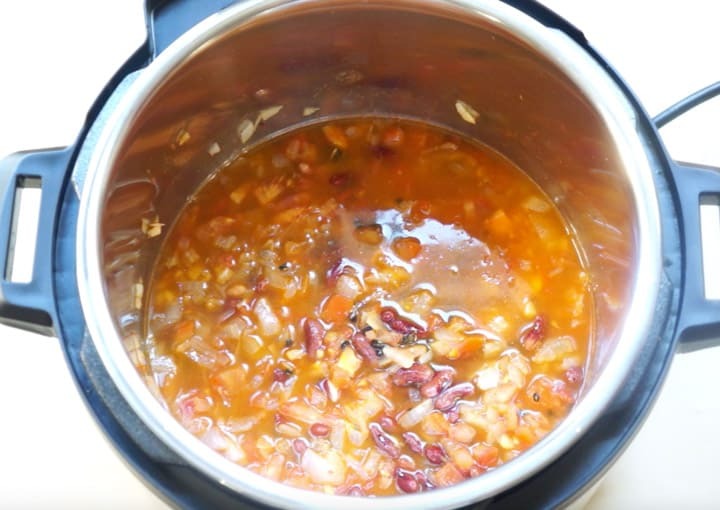 Technically you can use canned kidney beans, however as they are pre-cooked, you will have to add them at the end and simmer for 5-10 minutes. I feel there is no advantage of using canned kidney beans in this recipe, as it does not help to cut down the cooking time. You will still want to cook the dal for the same amount of time to get the perfect creamy texture. So why not save some money and use dry kidney beans! 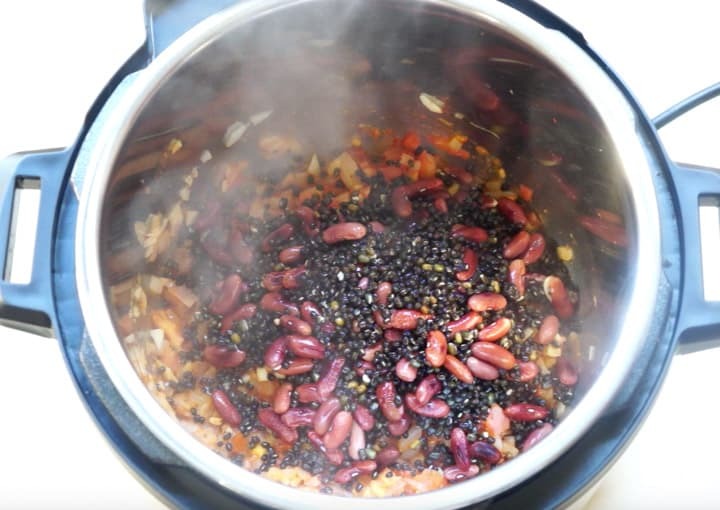 √ Soak the Dal and Beans to get the best texture. 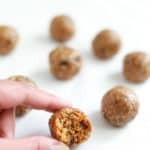 √ To make this recipe vegan, just skip the butter and replace with oil of your liking. √ This dal is super creamy, even when cream is not added. Top with cream or coconut cream at the end when serving! √ Mom’s tips to get the perfect reddish color similar to restaurant style dal makhani – Soak 2-3 Kashmiri red chilis for half hour. Then grind them to a paste with some water and add when you add the tomatoes. Kashmiri chili’s are very mild, so they will not make the dal too spicy. Do skip the chili powder in the recipe if you go this route. 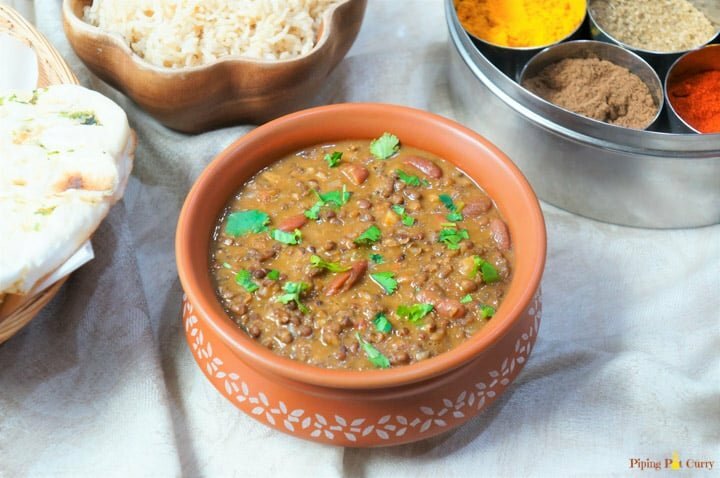 √ This Dal Makhani is even more delicious the next day, so it is perfect meal prep and enjoy for the week. Authentic Punjabi Dal Makhani (Madras Lentils) made in Pressure Cooker or Instant Pot. This restaurant style Dal Makhani made in the pressure cooker is rich, creamy and flavorful. Rinse and soak lentils and beans in water for 4 hours or overnight. Start the pressure cooker in saute mode and let it heat. Add oil and cumin seeds. When the cumin seeds change color, add onions, ginger and garlic. Sauté for about 3 minutes. Add tomatoes and spices. Stir and saute for another 2 minutes. Drain the water from the soaked lentils and beans. Add them to the instant pot. Add water and mix the ingredients. (optional) In a steel bowl, add the ingredients for brown rice. Please a tall trivet and the bowl of rice on top of the trivet. Press cancel and close the lid with vent in sealing position. 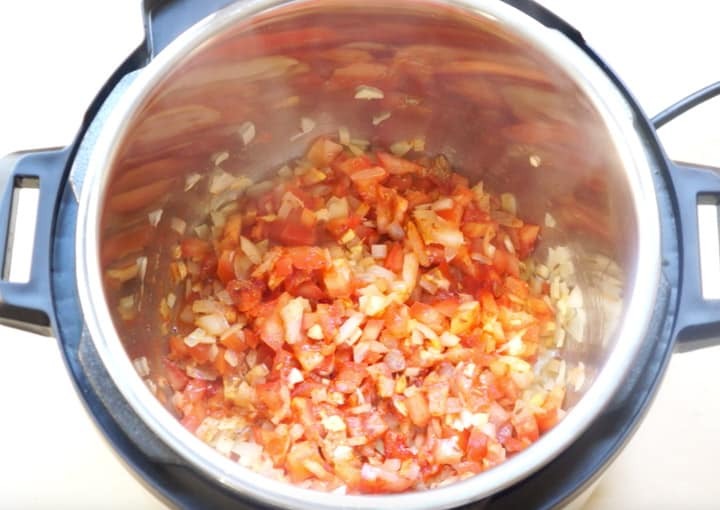 Change the instant pot setting to bean/chili, which will set the timer to 30 minutes of high pressure cooking. When the instant pot beeps, do a natural pressure release. Open the lid. (optional) Using tongs, carefully take out the bowl of basmati rice. Then take out the trivet. Stir the dal well. If needed, add water to get the desired consistency. 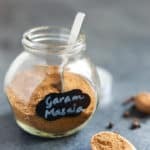 If you like, add more garam masala to taste. Stir in the lemon juice and garnish with cilantro. Dal Makhani is ready to be served. 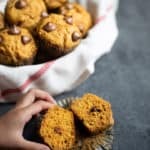 To make this recipe vegan, just skip the butter and replace with oil of your liking. Mom's tips to get the perfect reddish color similar to restaurant style dal makhani – Soak 2-3 Kashmiri red chilis for half hour. Then grind them to a paste with some water and add when you add the tomatoes. Kashmiri chili’s are very mild, so they will not make the dal too spicy. Do skip the chili powder in the recipe if you go this route. This recipe was created in a 6qt Instant Pot DUO60 Multi-use Pressure Cooker and has been updated to make it easier. I typically cook brown rice for 22 minutes – won’t it be overcooked at 30 minutes? Hi Mary – As we are cooking the brown rice pot-in-pot, it does not overcook in 30 minutes. If it were in direct contact with the heat in the main pot, I agree it would have overcooked. I hope you enjoy the dal & rice.